This is a July 22, 1966 photo of CORE's National Director Floyd McKissick. 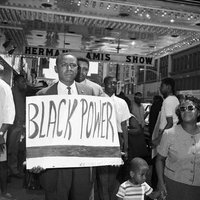 In the photo he is holding a sign saying 'Black Power' while standing in front of the Apollo theater on 125th street in Harlem. © Bettmann/CORBIS, “photo of CORE's National Director Floyd McKissick,” corenyc.org, accessed April 22, 2019, http://corenyc.org/omeka/items/show/93.